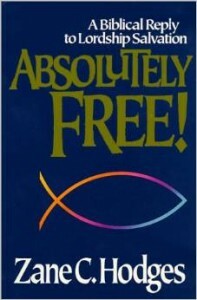 Written in 1989, this book has been the declaration voice of the Free Grace Movement. At that time Hodges was the long-time professor of New Testament Greek at Dallas Seminary. Since his departure from that seminary he has been influential in founding and writing for the Grace Evangelical Society (GES) which advocates the Free Grace position. The subtitle to this book is, “A Biblical Reply to Lordship Salvation,” having appeared on the scene just one year after John MacArthur wrote The Gospel According to Jesus. Hodges’ main thrust is to show that Lordship, either before or after salvation, is unnecessary as proof or evidence of salvation since a believer may remain in a carnal state his entire life. Hodges uniquely interprets James chapter two as having nothing to do with false faith, but only with Christian faith. “’Can faith save him?’ But James is not talking here about salvation from hell. Why should he? He and his readers were born again” (124). He also uses John the Baptist as an example of a believer who denied the very faith that saved him and yet remained a believer. He says, “To put it plainly, at this critical juncture in time, John the Baptist does not believe that Jesus is the Christ, the Son of God. Instead, he questions this truth. Does he then have eternal life? Of course” (106). In addition, Hodges explains Romans 10 as having nothing to do with salvation. “So the salvation Paul has in mind here is broader in scope than simply salvation from eternal damnation. Instead it embraces the whole range of spiritual and personal deliverances which a risen Lord is able to bestow on those who call upon Him for it” (196). Such is the tortured interpretation Hodges uses to denounce the Lordship teaching.